To the Begman mind, magic does not exist. Begma is a society governed by Rules and Laws and, most importantly, SCIENCE! If the world has a problem, the problem can be solved by Logic, Reason, Thought, and the APPLICATION of the LAWS of SCIENCE! Unfortunately, most of the science is not true science. It is mad science. 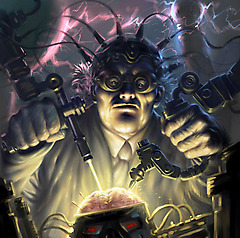 And what powers mad science is magic. All Begman Artificing is Magic, just like a fireball is a fireball and an invisibility scroll is an invisibility scroll. It is Magic with its own internal mystical laws and manifests in machinery and devices. Begman magic is reproducible by anyone with a set of Begman Blueprints and the right Engineering Knacks. Unlike common magic, Begman Artificers and Engineers build anything and everything from moving picture boxes to dirigibles to submarines to tanks. Begman magic ranges widely from the enormous airship to tiny, pocket-sized devices and everything conceivable in between. They have managed a large number of 20th century devices seen through the lens of Victorian scientific thought and magical applications. They have perfectly working lightbulbs, but these are mystical crystals that consume aether from the air and ignite it instead of strips of tungsten heated with electricity. While Begman Society is populated heavily with artificers and engineers, Begman magic does not work outside Begma without the right Knacks. Devices are often shipped to various corners of the Golden Circle, but without a Begman Engineer to work it, the device often turns in on itself and explodes in an enormous shower of sparks. Unfortunately, Begman Engineering has picked up a reputation for "exploding on contact." This is not entirely true: small, non-magic powered devices may work fine outside Begma. Small, magic-powered devices may not explode. But anything of sufficient size simply cannot operate without the Begman Knack. It simply does not work. In the mad rush during the Begman Enlightenment to rid the world of old superstitions and beliefs in exchange of Science! They threw the baby out with the bathwater and all other forms of magic that is not related to Engineering, SCIENCE, and steamworks was simply dropped on the floor. Certainly some families keep the Traditional Ways from Before the War, but these families are considered Arcane, Backward, and Enemies of Progress. They are best not mentioned while Begmans frantically build factories and devices and the Conveniences of Tubes. There are rumors that before the coming of Progress, Begma had other forms of magic. Of course, these rumors are ruthlessly squelched by the Ministry of Tourism. If there is to be any truth found in them, it will be found outside of Begma. The Begman Magic 8-Ball Manufacturing Co. produces Begman Magic 8-Balls. They have very similar sayings as Shadow Earth Magic 8-Balls. They are the likely source of Magic 8-Balls appearing throughout Shadow — not the other way around. They are 6.95 and can be purchased by the dozen. They have no mystical powers whatsoever.